Europe takes their Beer sites seriously. Which isn't too surprising, since the beer tends to be better than most American brews. 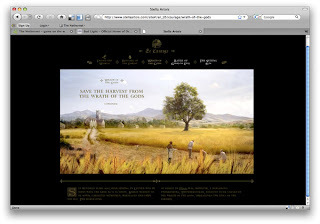 The last site for the week is Stella Artois. The site starts out with clips from the variety of video that was created just for the site. 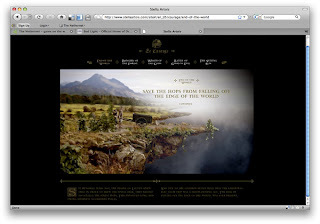 An earlier edition of the site has a 2-3 minute movella (like that? i do) that followed a timid beer man trying to get his bottle of Stella from the brewery to his bar in 19th century Paris. (i'm guessing on both the year and the city). This movella would stop at certain parts to allow you access to vere off into a subsection of the site. It was done really well and I'm sad to see it chopped into clips. I wonder if it was the public, or a client who didn't like watching the movie over and over when they visited their site. Other than the video crafted just for the site, and it's many sections, my favorite part of the site is the games. They're done right. The first set of games are based around the hardships of making beer in the 13th century. Everything from the literal end of the earth, to the wrath of gods, plagued the poor villagers who only wanted to make a good beer. You play 5 games to see if you could keep the taps flowing. The games are beautifully simple and perfectly contextual. The first one, seen above, has you saving the villagers and the hops from tipping over the edge of the world. The villagers and moving objects in the game are actual video layered on an almost painted landscape. You move the mouse to the left or right to balance the world as it begins to tip. Another one has you saving the barley fields from warring gods. (hint: when the storm hits, click in the clouds). I won't go into the other ones, but they're all as sweet looking as the ones above. The other set of games also have a interesting spin on the "send to a friend" mechanic. 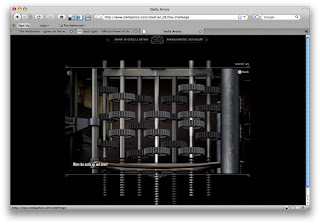 There are 4 visual puzzles involving gears, pulleys, nicks and skizzlewits. 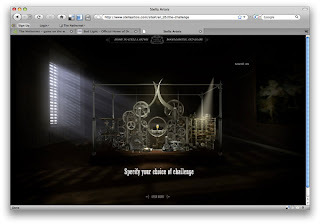 Although you can solve the puzzles yourself, the real intent of this is to get you to challenge a friend to solve one. If they lose, they owe you a Stella and vice versa. All of them seem tough. I wonder if they're fixed to always get you a beer. Crafty. This site is worth a visit. I don't plan on saying that very often in the course of this blog. Not because everything I see isn't worth it, but because I'm more interesting in reporting/exploring than being a "Hey this is cool go look at it" site (which makes up about 95% of blogs it seems). But this site is something else.